The tiny house movement is growing. With more and more people looking to downsize their space and utilities in favour of a lower carbon footprint, and downsize their belongings in favour of a unique and fulfilling living experience, many of them have turned to tiny houses. With the minimal costs and long-term benefits of tiny house living, it seems like an idea that everybody could get on board with. However, many of those looking to join the tiny house movement don’t know where to begin. From building supplies to tiny house plans, creating your small home can seem overwhelming. But we’re here to help you. Many tiny house plans cost anywhere between $300 and $800. But here are 6 awesome tiny house plans that you can download for absolutely free! One of the first tiny house plans designed and used for full-time living. Features: Full working kitchen with refrigerator, washing machine, sink, mini-oven and lots of storage space. Also includes an office nook, living area with couch, propane fireplace, coffee table, folding dining table with two chairs, a queen size sleeping loft and a guest loft that serves as storage when not in use. The house has a miniature bathtub/shower and a porcelain toilet and sink, which means that it connects to a sewer or septic system. This tiny home, which was designed with practical furnishings that can be converted into a variety of uses, can easily fit six adults and six or more children comfortably. Features: The main sitting area features a trundle sofa-bed storage combo, which rolls out from under another bed that sits on a platform and acts as a loft. There are rungs on a shelving unit that double as a ladder to get up to the loft. The kitchen features a counter that can be transformed into a full-size dining table or work space, and wood panels cover the sink to allow for even more counter space. The original model doesn’t have a hookup for water, and therefore no bathroom. Additional plans, however, feature all of the amenities needed for full-time living. Features: Designed to be used during all seasons, the writer’s cottage features a loft, a bathroom with a Sun-Mar composting toilet system, and a kitchen with cabinets, counter space and a sink. The tiny space also includes a folding writer’s desk that doubles as a dining table, a small couch, a freestanding wood stove and storage space for books. This tiny house on wheels is perfect for those who don’t like to be tied down to one place. Features: Sleeping loft, storage loft, kitchenette, bathroom, which includes a bathtub, composting toilet and waste hatch. Other features include a laundry closet and fire place. The plans also include DIY electrical and plumbing sheets. As far as tiny houses go, this one is on the spacious side. The two-story cabin even has a balcony on the second floor. Perfect for those who want to go smaller, but aren’t ready to commit to a single room layout. Features: The first floor features an all-purpose room, a kitchenette and a small bathroom. Stairs lead up to the second floor, which features a bedroom, full bathroom and balcony. Features: Single-floor house that has one bedroom, one bathroom, a kitchen, dining room, living room and even features a washer and dryer. 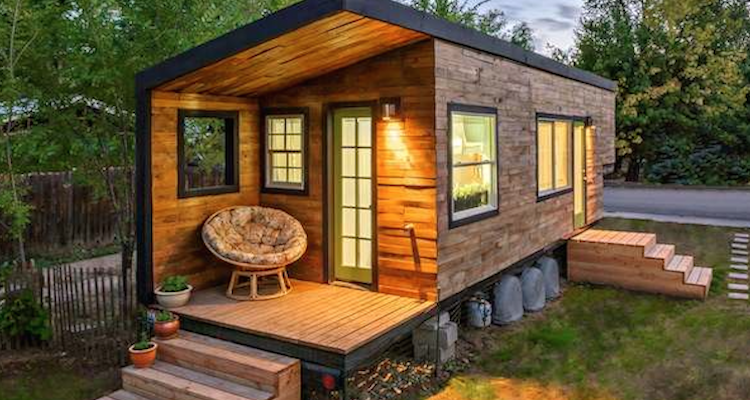 The tiny home also has a small porch and a crawl space. While most of the plans don’t have an estimated total cost, you can use this free tool to calculate your personal building costs. To see more free plans head over to the Small House Catalog.